As well as showing off the the Vive Pro and the Vive Focus, HTC was at Mobile World Congress to show us what we can actually do with those VR headsets. While the company continues to improve the hardware capabilities of its main headset and explore the realms of mobile VR too, it also wants to make sure that it's giving people plenty of reasons to own them. The experience that captured most people's attention at the show was one that involved standing inside a hot air balloon basket as you are virtually hoisted up into the sky over a canyon. My attention, however, was drawn to the one where the demo room replaced the showroom floor with artificial grass and training cones. HTC was showing off a new VR coaching and rehab program for footballers. 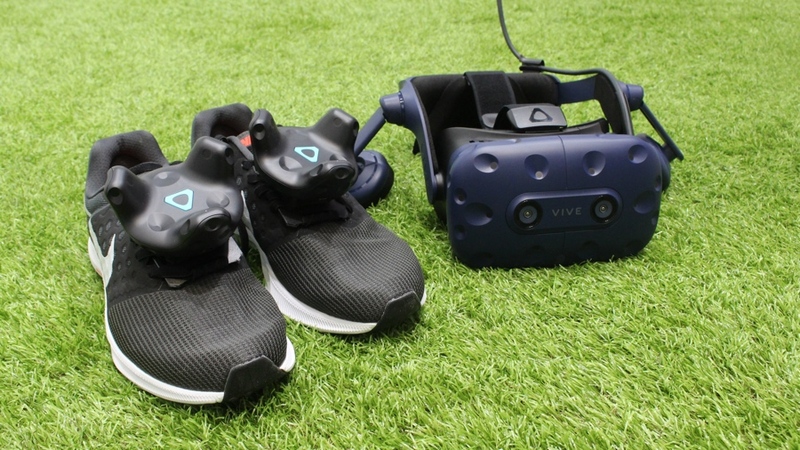 It's been designed by Mi Hiepa Sports, a company in Manchester, who are using a Vive Pro (sans cables) and Vive trackers mounted onto shin pads and trainers to track movements independently in 3D space. What's also interesting is that these particular Vive trackers are version 2.0 of the accessory. The first version only launched last year and nabbed our VR Accessory of the Year at the 2017 Wareable Tech Awards. This is also the first time that I've got to experience Valve's new 2.0 SteamVR Tracking system, which among other improvements now offers the ability to cover a play space of up to 10 x 10 metres. As I'm preparing to pull on my trainers and shin pads Adam Dickinson, development director at Mi Hiepa Sports, tells me that its program is already being put to use at Manchester United's training ground where, from the first team to the academy, players are able to make use of it. Stoke City's man in between the sticks Jack Butland apparently wanted one in his house after he tried it, and even football traditionalist and former Manchester United player Paul Scholes gave it the thumbs up. The idea is that, by using VR, the company can not only help to hone the talents of the next generation of players, but also help the seasoned professionals work on the weaker aspects of their game by making things a bit more fun. It also hopes to offer injured players an alternative route to recovery, with the aim of providing both physical and mental benefits as part of a rehabilitation program. I get to try out a passing drill, where balls are delivered to my feet and I need to pass the ball into one of a series of smaller goals in front of me. First though, I need to get into position. With the headset and the trackers on, I look down to my feet, check the studs on my virtual boots and then make sure I'm positioned inside a big circle that indicates the space where I can move. As the first drill starts, the first ball arrives and I pass it into the small goal in front of me. Aside from the improved resolution on the Vive Pro I'm immediately struck at how wearing all of this kit doesn't feel as cumbersome as I imagined it would be. I begin to forget about the headset and as the Vive trackers are so light, you don't feel them down on your feet and shins. Then there's the responsiveness of the trackers when striking the ball. There's absolutely no signs of lag. It just feels very natural and very real. Clearly a lot of work has gone into the ball physics to make it behave as it would do in real life. So it will bounce awkwardly, forcing you to change the way you connect with the ball. I always have that tendency to hold back a bit when I'm moving in VR, but it doesn't take too long before I'm starting to treat it like a drill on a football pitch. I now realise that I can volley the ball with precision, and even take a touch to control the ball before passing it into the net. The field of view is put to good use, forcing you to scan the area quickly to identify where the ball is coming from. As the training progresses, this quickly gets more difficult and adds to the authenticity of the drills and the unpredictability of a game situation. I can see why footballers would be instantly hooked on this. After I complete a couple of levels of the training, my session data is broken down to explain just how well I've done: a top-five position on the leaderboard. Dickinson says players tend to use these VR drills for roughly 15 minute sessions and the idea is that coaches are able to use the data to track progress and see whether actual improvements are being made. I've used it for a lot less than 15 minutes but even I could see in that time how well Vive's trackers were able to track my movement. If this is what the next generation of virtual reality is going to be like, then sign me up. Before I put that headset on and pulled on those shin pads, everything was telling me that this was going to feel all a bit too gimmicky. Instead it proved just how far VR has come in such a short space of time. HTC is providing the hardware tools that just keep getting better but it's companies like Mi Hiepa Sports that are taking that hardware and showing what is possible with VR beyond the realms of gaming. AR might be the talk of the town, but this Vive experience reminded me that there are still some truly groundbreaking things happening in the VR world.